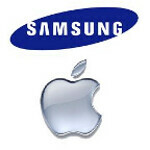 Metrics firm Strategy Analytics expects Samsung to widen its lead over Apple in the smartphone wars of 2013. The metrics firm puts Samsung's success on the Korean manufacturer's ability to compete in all tiers from low-end devices to high-end flagship models. The company is expected to launch the Samsung Galaxy S IV in April and the Samsung GALAXY Note III sometime in 2013 and both have the potential for huge sales. Strategy Analytics expects Samsung will sell 290 million smartphones this year, up from 215 million in 2012, which would produce a 35% annual gain. The metrics firm estimates that Apple will sell 180 million units of the Apple iPhone in 2013, up 33% for the year. That should result in a 33% market share for Samsung in the smartphone arena (no plug intended) compared to 31% for Apple. Some analysts are expecting Apple to offer an Apple iPhone mini this year for emerging markets like China and India. Topeka Capital's Brian White discussed the possibility of such a smaller and lower priced phone being released in 2013. As we told you the other day, White sees the next iPhone offering consumers a choice in screen size and colors. Neil Mawston, executive director at Strategy Analytics said that he while he does expect to see an Apple iPhone mini sometime in the next three years, the current full-sized model is providing enough growth at the moment. Mawtson expects to see the iPhone mini in 2014 when Apple is looking for "fresh growth streams". He also said that the Apple iPhone mini would be targeted to the hundreds of millions of pre-paid users who can't afford the current Apple iPhone. Strategy Analytics forecasts global smartphone shipments jumping 27% to 875 million units in 2013, slower growth than the 41% increase seen in 2012. Growth is expected to slow in North America, China, Western Europe and some areas of Asia. 2013 will be a great year for sammy! I expect 2013 will be the year that apple starting to be stagnant and irrelevant. My take on prediction/analyst... Apple sales 3% less iphone, and drop big time in market share. Reason.... 4" iphone 5 (or 5S) starting to look uncool compared to 1080p 5" droid. All the cool guy/gal will eventually move to android. That is simply not true about Microsoft. Even if they have 4x increase in sales compared to previous quarter , they will LOSE the market share. Here's how it will grow compared to previous quarter : + 20-35 million units of android (10-15% increase ) + 20-30 million units of iPhone (up to 100% increase) + 8-12 million units of WP8(for up to 300% increase in sales actually) This would give a quarterly total of: ~ 145M android phones shipped ~ 45-55M iPhones shipped ~ 12-16M Windows phones shipped Getting the math now? Wait a minute, is that sarcasm?? Or a true fanboy rant?? That's funny cause i think none of your analysis holds water. Open your eyes boy... You cannot comprehend what people will do cause you can't get in their head. Now as much as i want the headline to be true, i'll be skeptical. I don't trusts analysts. Ha, typical troll you are. Bashing on Nokia and BB on SammyxApple article. Anyways, time to open eyes. Lumia series won't be a failure. WP8 is getting better each day. Updates are coming real fast, and thanks to quasi-closed ecosystem, the updates don't take months as in case of Android. Lumia 920 sold very well everywhere. It still is taking away merit in Amazon wireless' sales charts. In china it's outrageously popular. Everyone knows that in Europe it's selling well. Indians, Brazilians are waiting with huge interest. So, go troll somewhere else. Nokia/MS isn't aiming for top yet, current goals are much modest, knowing bad history of WP. So I'll stick with optimism. i still dont know a single person with a windows phone. Thats win 7 or win 8. I knew more people with windows 6.5 phones. I don't know about US and Europe, but in Asian countries Sammy might get hurt because of rise of local manufacturers who are improving quality while being much affordable even than Sammy. In the markets which don't run on contract system this means a lot. Just for example check out the daily interest and user rating charts on GSMArena, http://www.gsmarena.com/ How a local manufacturer managed to beat even globally popular S3. And most of the hits are only from a single country (Which developed words looks down on), India. I am Indian and I see this company grabbing most of the business here, mostly inflicting damage to Sammy's turf. I see number of people buying that phone. The one that was hurted the most in low end market were nokia. Nokia Asha line were good, but not great. It's losing the sales compared to CHEAP CHINA/INDIA android. In malaysia, low end market now opted for CHEAP android. Nokia is a sure dead. Agree. Nokia Asha line is also in danger. I never assumed Asha series to be a success but somehow it managed. And similarly, it's also pulling the customers that were hoping to opt for phones like Galaxy S Duos, Ace, Y, Wave. Even S2! Same goes for all other companies' low and mid tier phones. Makes sense. I mean such a one aimed portfolio that apple bragged about will ultimately limit sales with less choices. Not MAKE , They WILL!! Not only DUST but their WORDS!!! Love my Galaxy S3. Everytime I pull out my phone Apple kids/guys/adults crowd around and I show them all the features n tricks my phone does. Trust me Apple fans eyes are wide open. wait.........an iphone mini?? looooool isnt the iphone already "mini" lol how small do they plan on makin it? haha alright im not trying to be funny but logical about it... know what i mean? AGREE!!!! Apple should make iphone JUMBO instead of iphone MINI. The current line is too mini if compared to android 4.3",4.5",4.7". Samsung makes great phones but IMO it'll be better if they'll improve their design and build quality much like HTC's. LOOK OUT SAMSUNG, SONY IS ON THE RISE! I really hope all Android maker will rise and stomp Apple. AGREE!!! I hope apple apple got severe damage so they won't be too cocky anymore. I don't know about US and Europe, but in Asian countries Sammy might get hurt because of rise of local manufacturers which are improving quality while being much affordable even than Sammy. In the markets which don't run on contract system this means a lot. Just for example check out the daily interest charts on GSMArena, http://www.gsmarena.com/ How a local manufacturer managed to beat even globally popular S3. And most of the hits are only from a single countries (Which developed words looks down on), India. I am Indian and I see this company grabbing most of the business here, mostly inflicting damage to Sammy's turf. I see number of people buying that phone.